Flavio Menezes, Economics Professor at the University of Queensland, has an interesting piece at the Conversation fact checking a bold claim by federal MP Andrew Leigh that the GST is as economically inefficient as the income tax and less equitable as well. I think everyone agrees the GST is less equitable, and hence a GST hike may require some compensation for low-income earners, so let us focus on the economic efficiency issue, on which I disagree with Andrew Leigh. Flavio, however, concurs with Andrew Leigh, noting that he has correctly cited a recent Treasury finding regarding the economic efficiency costs (a.k.a. deadweight losses or excess burdens) of the GST and income tax, both around 20 cents for every dollar raised. These efficiency costs come from the distorting impact that taxes have on economic behaviour, particularly through decreasing the attractiveness of work relative to leisure, which both the income tax and GST do (as the GST raises the prices of goods and services purchased using income typically derived from working). 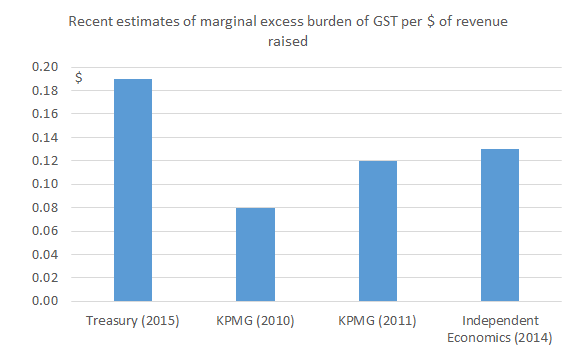 The problem with relying on the recent Treasury study is that, as the Treasury itself acknowledges in the paper, its estimate of the efficiency loss from the GST is much higher than previous findings (e.g. a range of 8 to 13 cents per dollar raised in studies from KPMG and Independent Economics as shown in the chart below). The Treasury cannot explain the reason for this discrepancy, noting rather obscurely (on p. 39 of the Treasury working paper) that “subtle variations in model calibration can affect the relative marginal excess burden of the GST.” My reading of the Treasury working paper is that the Treasury is not particularly confident in its finding. Hence, I would suggest that Andrew Leigh should not be relying on it to make such a bold claim about the GST. It is clear from basic economic logic that a GST would be a more efficient way to raise revenue than the progressive income tax that Australia has. Economists have long known that raising revenue using a broader base with a lower tax rate is more efficient. This is because the efficiency cost of a tax increases more-than-proportionately with the tax rate, as John Freebairn notes in his review of Flavio’s fact check. For example, a 20 per cent tax rate has more than twice the efficiency cost of a 10 per cent tax rate. Broadly speaking, this is because as tax rates increase they start discouraging greater amounts and increasingly more valuable amounts of economic activity. Currently, the top one percent of taxpayers who pay the top marginal rate contribute 17 per cent of all personal income tax. And the top 10 per cent contribute 46 per cent of all personal income tax. Over the next decade more Australians will move into the top tax brackets. The proportion of taxpayers in the two highest tiers is expected to increase from 27 per cent to 43 per cent in 2024-25. The Treasury Secretary noted that this discourages labour supply at the top end, encourages talented Australians to work and take their valuable innovations overseas, and encourages aggressive tax planning to minimise tax. It seems obvious to me that raising revenue through our current income tax regime comes at a very high cost, and that we should consider a change in the tax mix, with greater reliance on the GST. This entry was posted in Tax and tagged deadweightloss, efficiency, excessburden, gst, incometax, tax, treasury, uq. Bookmark the permalink. 1. It is not clear to me why having both an income tax and a GST at moderate rates is necessarily more efficient that having an income tax at a higher rate. Assuming the overall progressivity of the tax system is the same, the overall disincentive effects should be very similar – e.g. why would reducing the top marginal income tax rate but increasing the GST so that high income earners paid the same tax overall have any effect on incentives? 2. I have often felt that the disincentive effects of high marginal income tax rates on high income earners are exaggerated. First, the work-leisure substitution effect is partly offset by the income effect – e.g. if someone is working to achieve a particular living standard in retirement, higher taxes may mean that s/he has to delay retirement in order to achieve this standard. Second, I suspect that for many high income earners marginal income is a relatively minor motivator and that other factors are more important in evaluating job and career choices. Thanks for the comment, Paul. Certainly in the scenario you’re describing I agree there wouldn’t be much difference. But I think we could bump up the GST to 15%, even 20%, cut income tax and get a significant efficiency gain. At least most of the studies of deadweight losses of taxes I’ve seen would suggest that, except for that one most recent Treasury study.Regarding your second point, yes, there is an offsetting income effect, and I have to admit there doesn’t appear to be much evidence of disincentive effects, possibly because of a lack of suitable data and the power of our econometric techniques. It’s something I intend to have a closer look at.